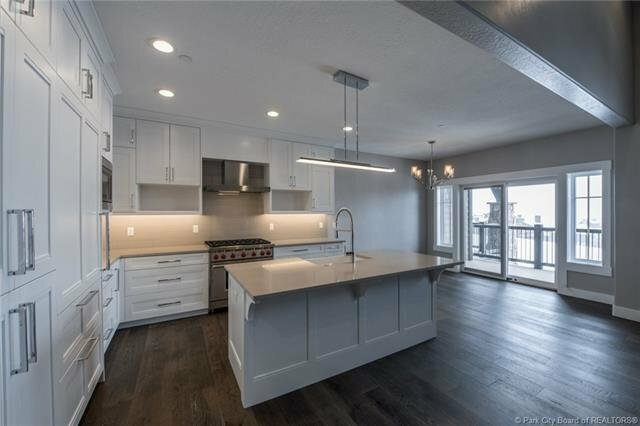 Beautiful Townhome at the Canyons - Walk to Skiing This luxurious modern townhome is located just steps from the Frostwood Gondola at Park City's Canyons Resort and is bordered by two fairways of the new Gene Bates-designed Canyons golf course. Vaulted ceilings, oversized windows, and slate, travertine, and hardwood floors lend elegance to this spacious 3BR/3BA dwelling. Custom alder cabinets, quartz countertops, and stainless Wolf and Sub-Zero appliances make the kitchen perfect for a chef. Enjoy fantastic views of Park City and the distant Uinta Mountains from the spacious interior. A single-car garage adds extra convenience.